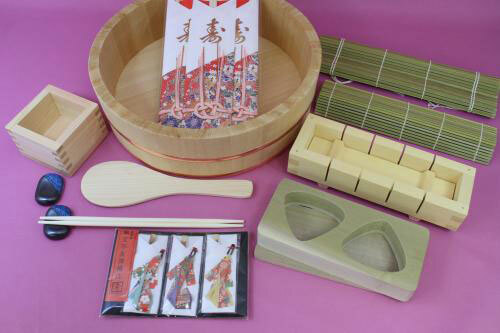 A cooking kit for making sushi rolls, pressed sushi and rice balls, which represent Japanese cuisine. The rice table is made from Japan's indigenous sawara cypress tree. It quickly dries excess moisture to prepare rice at its best. The professional equipment is easy to use without losing the food's shape. The kit includes wooden box sake cups essential to Japanese cuisine, a rice paddle and complimentary chopsticks. A buyer can choose a combination of equipment.